This has become an iconic photograph, used in books, articles and other publications to illustrate both 19th-century sewer building and, more specifically, the process of building a combined sewer in a stream bed. The stream, Mill Creek, rises near Narbeth, in Montgomery County, PA, and once flowed for five miles through West Philadelphia, from the aptly-named Overbrook railroad station near 63rd St. and City Avenue down to the Schuylkill River along the line of 43rd Street. Today, only the section of creek in Montgomery County remain above ground; within the city limits, the main creek and all its tributaries were incorporated into the Philadelphia sewer system, a 30-year project that began in 1869 and ended around 1900. The bottom half of the sewer, called the invert, was already constructed by the time this photograph was taken, and Mill Creek had already been diverted into this artificial channel. The masons are now constructing the top half of the sewer, called the arch. You can see the circular wooden form on which the bricks are being laid, two bricks thick at the top. The form is about 20 feet long, and once the mortar sets the form will be dismantled and reconstructed to build the next 20 foot section. Some of the workers have stood still for the camera’s long exposure, while those who moved while the shutter was open appear only as see-through ghosts. Two children look to be on their way to or from (or maybe skipping) school to observe the work. In the upper right is a textile factory building that had used the water of Mill Creek for industrial processes such as washing, bleaching and dyeing; now it will have to use city water for these purposes. On the left a remnant of the natural creek bed is visible, and in the background are houses that have already been built right up to the edge of the work in progress. After the sewer was completed, the land was filled about 30 feet above the original stream bed, the grid of streets was laid across the valley, and this once-rural area was transformed into part of urbanized Philadelphia by the development that quickly followed. The sewage of these new houses and businesses, carried by a system of tributary pipes, flowed into the Mill Creek Sewer, along with stormwater and the remnant flow of the above-ground portion of the stream. With the creek buried out of sight, it quickly dropped out of mind, and people who lived in the neighborhood called Overbrook, or even one called Mill Creek, could not tell you the source of those names. Meanwhile, forgotten or not, the old mill stream, now conscripted to the dirty job of carrying away a neighborhood’s wastes, still rolls on, beneath the streets. Here's our photo essay from last weekend's Philly Water's Best Friend competition at Mario Lanza Park in Queen Village. Thanks to all the dog owners, judges, volunteers and neighbors who turned out for a fun event that was part doggie pageant and part quiz show—above, Betty the pug tackles a tough question from the judges about keeping our waterways clean by picking up pet waste. Nice job, Betty. And a reminder—the Northern Liberties spokesdog competition is tomorrow at 3 p.m. in Liberty Lands. Yesterday, a group of volunteers braved the wet weather to plant the final two rain gardens at a partially depaved lot at Eadom and Bridge streets (just west of I-95) in Frankford. A crew including employees of the Philadelphia Water Department and GreenTreks, along with volunteers from the NorthEast Treatment Center, planted almost a dozen varieties of vegetation (including sedum, switchgrass, Virginia sweetspire and Viburnum) and brought the total number of rain gardens in the lot to six. In all, the Eadom Street project has converted 10,000 square feet of impervious concrete to rain gardens that allow stormwater to infiltrate the soil instead of flowing into our sewers. The rain gardens will manage stormwater runoff from two acres. More photos of yesterday's planting after the jump. Mayor Nutter swung by last week's Soak It Up! event in North Philly to commemorate the installation of stormwater tree trenches near 7th and Cumberland streets. The tree trenches are just one tool used to manage rain water and prevent sewer overflows into our rivers and streams. 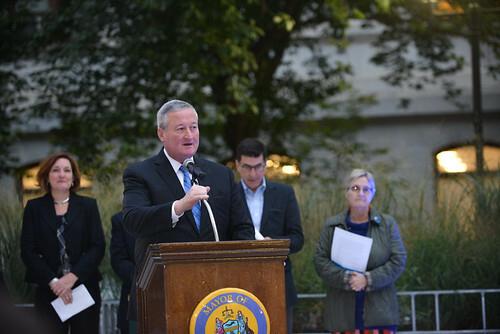 Check out our updated Green City, Clean Waters page for the complete story of how Philadelphia is using natural, green processes to solve the problem of combined sewer overflows. Students from the nearby John F. Hartranft elementary school helped decorate the tree trenches with flower plantings. There weren't just snacks. There were snacks and smoothies. East Falls—you're next. Join us on Thursday, April 5 at 4:30 at Queen Lane and Fox Street to dedicate the city's first stormwater bumpouts. On March 8, our second Soak It Up! event took place at 16th and Jackson streets in South Philly. Neighbors joined city officials and PWD employees to celebrate the stormwater tree trenches that absorb runoff and make 16th Street a green street. Above, children from the neighborhood plant flowers around the trees. PWD commissioner Howard Neukrug, Newbold Civic Association's Naomi Geschwind and Councilman Kenyatta Johnson after the ribbon-cutting. These kids are both expert gardeners and professional chalk artists.